If I'm going to gain five pounds on a one week vacation, I'm certainly going to enjoy the process. Who knew that Disney World had such wonderful treats! Originally, we ducked inside the candy shop on Main Street in the Magic Kingdom to avoid some crowds, but ended up making a wonderful pink and green discovery. These Red Velvet pink and green cake pops are so delicious. Red Velvet is one of my favorite cakes. Cake pops, red velvet, and pink and green! Perfect Trifecta! It's difficult to choose a treat with so many delicious choices. 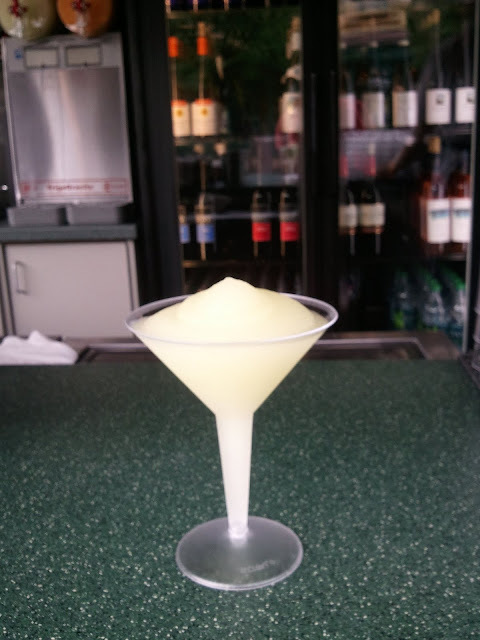 In Epcot, there's delicious food, but there are also delicious drinks. In Italy, be sure to try the Rosa Regale, a crisp red sparkling wine. France is home to my all time favorite, the Grey Goose Slushie. Yummy! Disney restaurants also offer a lot of fun and fantastic food. Our most fun meal was at the 50s Prime Time Cafe at Hollywood Studios. Our waiter was "Cousin Cooper" who scolded me for not having a happy plate and tried to feed me salad via helicopter. The twincesses thought that this was hilarious. Jiko, at the Animal Kingdom Lodge, was so delicious and the atmosphere was elegant and calm after a busy day in the parks. This was my favorite meal. The food had more flavor than I could have imagined and the service was stellar. The twincesses thought that it was very chic that we received warm rose water towels to clean our hands before dinner. That was new for them. 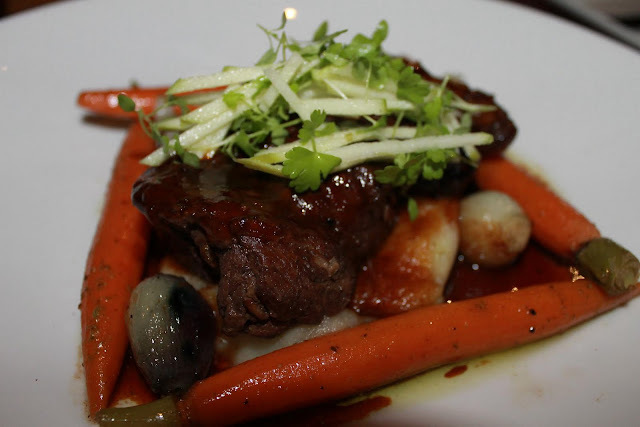 I ordered the Braised Beef Short Rib with Truffled Potato Puree, Pear Onions, Baby Carrots, and Cabernet-Tamarind Sauce. Oh. My. Goodness. I didn't know food could have such amazing flavor. The beef was fork tender and full of tangy flavor. At Disney, I prefer to eat in full service sit down restaurants as opposed to counter service establishments. The restaurants offer a guaranteed space and time for a meal; nothing is worse than having to wait in line for food after waiting in line all day for everything! Sadly, my two most disappointing meals on this trip were at two of my former favorites from previous trips. Service and food at the San Angel Inn and the California Grill were not nearly as good as they had been in the past. If you're planning a trip to Disney and would love to hear about a particular restaurant, please let me know...I've probably eaten there within the past 2 years or will eat there later this week. I'm happy to share my thoughts about everything from appetizers to kids meals, drinks, and desserts. If I'm going to gain five pounds this week, I'm going to enjoy the process! What foods do you enjoy on vacation? What are your favorite Disney restaurants? Oh my Goodness. That all looks so amazing. I love that candy apple! When we went to Disney we ate at the Mickey Mouse Cafe at the Contemporary which was really fun. Also there is a sweet shop at downtown disney with the BEST cookies ever. We're going in February with my 6 year old daughter and almost 3-year old son. Any restaurant recs for that age range? Oh my heavens, I'm so jealous! Looks so good! Have a great time! I did not catch those cake pops, they look delicious! I brought a Grand Floridian gingerbread house shingle cookie and rice krispie treats home with me though :) One of my favorite Disney restaurants is Le Cellier. Although I've heard that Jiko is wonderful; I didn't make reservations early enough this past trip though to try Jiko. I still remember eating at that 50s restaurant when I was 12! It was so fun! @Emily - Ohhh you're so right about the sweets at Downtown Disney. We did go to Goofy's Candy Company there. @Carter - All of the restaurants seem very kid friendly. The character meals are particularly popular. The girls LOVE the princesses at Akershus in Norway. Yesterday we saw Pooh and friends at the Crystal Palace. @PinkMaple - Le Cellier is amazing! I tried to get a ressie there but didn't have any luck. You'll love Jiko. It's been my best meal so far! @SarahBrooke - I remember the 50s restaurant from when I was younger, too! That's why I had to come back for a visit!